Beef by-products casein protein colloid chicken meal natural barbecue flavor natural flavor and natural turmeric (vegetable.) Fully edible and easily digested. Contains no plastic. Contains no added sugar or salt. Package of three bones. 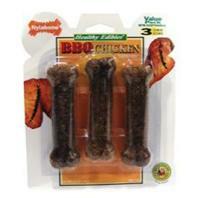 Nylabone - Healthy Edibles BBQ Chicken Bone - Regular - 3 per Pack product is categorised under Wholesale Nylabone Products, PA products, Wholesale Dog Products, Wholesale Food & Treats, Wholesale Treats.